Giveaway ~ Ginger Mail ~ Greeting Cards, Stationery Items & More! I love pretty cards and papers! 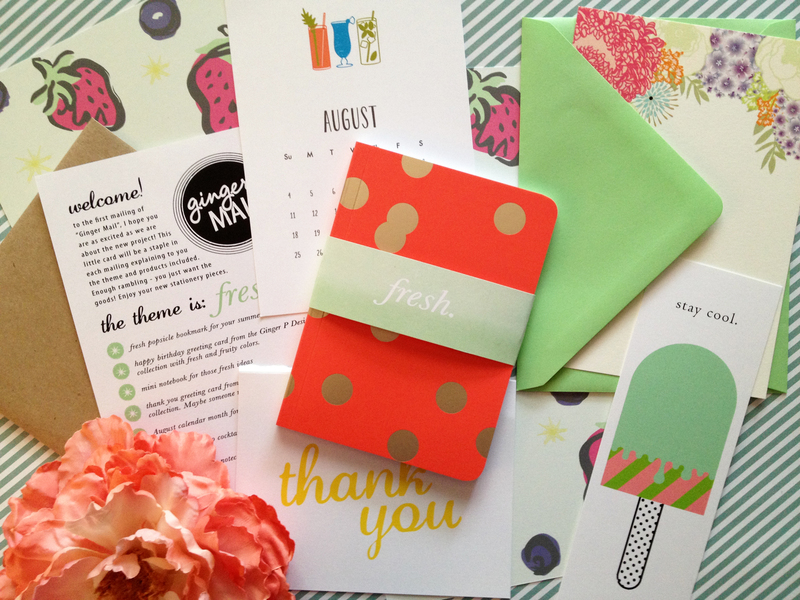 Imagine receiving pretty greeting cards and stationery every 6 weeks! I found a brand new service called Ginger Mail. When you sign up you will receive timely greeting cards, stationery items and other goodies every 6 weeks in your mailbox! Ginger Mail sent me their Holiday Garden Collection to review for free and to share with you! They are also giving away their next collection to 1 lucky reader! This is high quality paper goods! Gina of Ginger P Designs has a serious love and passion for paper design and stationery and it definitely shows in her beautiful work! I just loved every piece of the Holiday Garden Collection! I used several of my Ginger Mail for gift cards and tags this Christmas! I love how all the items correlated with each other, they were all a garden/ leaf design. I really love the cute recipe card and the list pad! I think this mail service would be great for anyone! Great for those of us who are too busy to go and get cards when you need them most, a procrastinator, or for those of us who just enjoy getting creative and fun pieces in the mail….like Me! Each time there will be a theme, so all of your items relate to one another, and the items will correlate with the upcoming season. An example for one package of Ginger Mail for April 15th would be: Mother’s Day greeting Card(s), mini spring pennant banner to hang in your home, a “congrats” greeting card to use for any May/June graduations, May calendar page, fun recipe card for the grilling season, Wedding wishes greeting card, gift tag for wrapping, and drink flags! For more information and how to sign up, click the link here to go to the Ginger Mail website. Win 1 Ginger Mail Collection! The giveaway will end at 11:59 pm CST on 1/20. Disclosure: I received the products mentioned above for free. Regardless, I only recommend products or services I use personally and believe will be good for my readers. rays of bliss is not responsible for fulfillment/Shipment of prize. I like the Merry and Bright lights holiday cards for next year! I like Monogram note cards…I’m almost out! I LOVE “hello gorgeous”! I like sending random, encouraging notes to my friends. Anything stripes or chevron, and love the baby greeting cards! I love the I Think You’re Amazing card! I would choose anything pink! I like the “I Think You’re Amazing” card. I like the cute “baby boy” greeting card. just wanted to say hello- cute design! I like the Thank you so much cards. I am always looking for thank you cards.